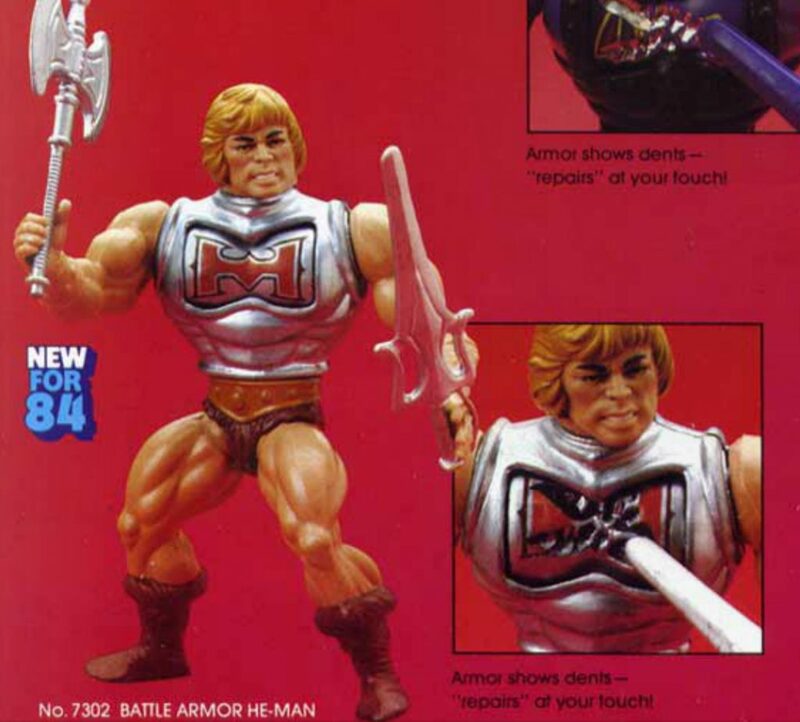 I’ve been able to locate commercials for almost every item released in 1984, including Battle Armor He-Man, Battle Armor Skeletor, Orko, Prince Adam, Fisto, Clawful, Buzz-Off, Whiplash, Kobra Khan, Webstor, Roton, Dragon Walker and Snake Mountain. I could not locate 1984 US commercials for Road Ripper, Stridor, Jitsu, Mekaneck (he appears in a 1985 commercial with Land Shark), or the Weapons Pack. I’m not sure if they exist, although if I had to guess I would think Mattel would have at least produced a commercial for Road Ripper. 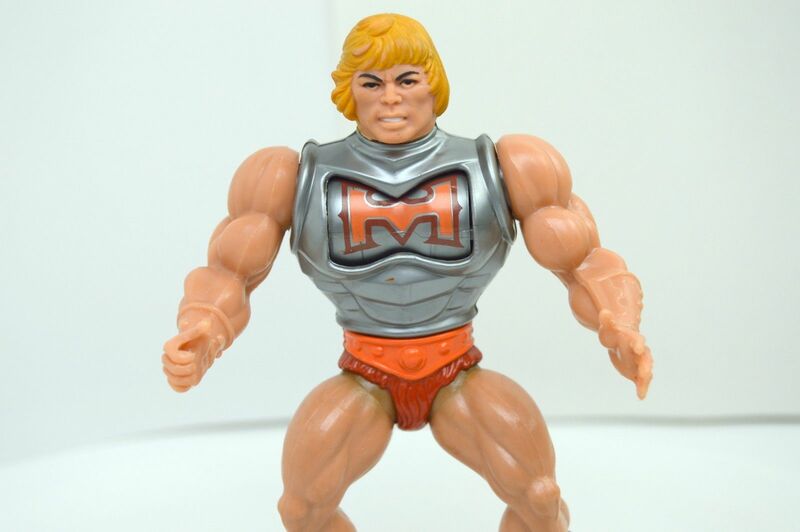 One interesting note – Battle Armor He-Man appears to be an early production sample. The one featured in several of these commercial looks identical to the early version from the 1984 Mattel Dealer Catalog. This sample is a bit different from the final toy in that the “H” symbol has a darker outline and is filled in red rather than orange.He also has relatively dark-colored boots and loincloth. Clawful is also an early production sample, with brown Skeletor boots. You can read more about the evolution of his design in the feature I wrote on Clawful several weeks back. One nice thing about some of these commercials is that characters that didn’t feature prominently in commercials from previous years get a little more spotlight here, including Mer-Man, Zoar and Stratos. I don’t remember being bothered by the lack of resemblance to the cartoon, although I didn’t see it in person until probably the late 80s, along with the Fright Zone, I remember being more impressed with the Fright Zone though. A Mekaneck commercial _did_ exist, but even the clip of it seems to have disappeared from Youtube. Thanks Matthew, I didn’t know that. Hopefully it will reappear. I’ll keep an eye out for it. Love the site. I often watch old adverts and tv junctions on you tube in particular from my local UK tv region for ITV Granada. I came across a rarity a U.K. specific She-Ra ad. There is also a dubbed with English accents US ad for the Dragon Walker. On you tube there is also somewhere a U.K. specific ad for the Horde. There was a UK promotional commercial for Jitsu, which I only remember seeing once. It portrayed He-man battling Jitsu in a jungle setting with Skeletor in the background. Aired just as the figure appeared in the shops. The Evil Horde had two UK specific commercials that panned through a mist to show the Horde in silhouette. A voiceover said, “Can He-man survive The Evil Horde?” Likewise in the 2nd advert for Skeletor. Wow, thanks for the information! I really hope it turns up, I’d love to see it. Just found this it’s a UK specific advert from January 1986 for the debut of princess of power toys. https://m.youtube.com/watch?v=4zpaahvCIFc You have to forward on a little but the most interesting bit for me was how it wasn’t marketed a primary female toy. Notice how he man is featured even.